Forklifts are ubiquitous in warehousing and other industrial operations, but aren’t necessary in many other applications, such as small assembly shops, retailers, auto dealerships, and others that require materials movement but do not need a forklift, with its maintenance costs, safety issues, driver requirements and its footprint in a smaller facility. What methods can you use instead? There are a variety of powered and non-powered materials transport tools available. Among them are stackers, lift transporters, and powered lift hand trucks, all of which are more ergonomic and speedy than hauling materials on carts, trays, wagons and so forth. Ergonomic because they don’t require bending and lifting for loading and unloading. Speedy because they roll smoothly and have some form of lift for loading and unloading, thereby saving on loading time. The common pallet jack is good for moving pallet loads around, but only after the pallet has been loaded off a truck. Facilities that don’t have a forklift or other means to move a full pallet from an elevated trailer to the ground must seek alternative means. These beefed up hand trucks are a real boon in manual materials transport. The hand truck platform mechanically lifts up to 36″ to receive product and can be positioned precisely for loading and unloading without needing to manually do the heavy lifting. Great for handling totes, cartons, buckets and bins in loads up to 350 lbs. Once the hand truck is loaded, simply tilt back slightly and roll the load to its new location. Again, the powered lift assists in making the unloading process very easy on the body and faster. These relatively small stackers use a continuous chain drive for positioning the lift. The forks can be used to lift pails and buckets by straddling them or direct lift cartons, totes, and bins. With a lift height of up to 65″ and capacities from 185 lbs. to 450 lbs., these battery powered devices roll on 4 casters so that there is no need to tilt the load during transport. You also have the option of using the standard platform instead of forks, as well. Portable stackers, with load capacities of between 300 to 350 lbs., have a narrow 28″ wide footprint for fitting into smaller spaces like packing & shipping areas, and offices. They run on 12V batteries and can be folded up for storage when not in use. One nice thing about them is that the platform is suitable as a work positioner to assist in assembly/disassembly work. Manually operated stackers lack the battery power, but are a good choice for light to moderate weight loads ( up to 1,000 lbs.). The lift is foot pump actuated and can use both platforms and forks for carrying loads. 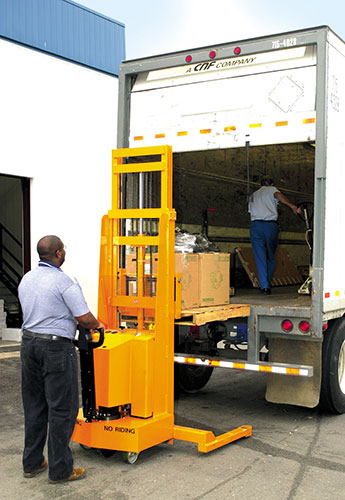 A lift height of up to 65″ allows for lifting light pallets into pick positions, as well. Counterweight stackers can handle loads up to 1,000 lbs. and lift from 62″ to 74″ high. Able to handle pallets, these stackers can lift full loads to higher levels because of their counterweight design which keeps the stacker balanced when under load and lifting. Also battery powered, these machines have very low load centers between 13″ and 15″. Powered stackers not only lift and position loads, but they transport under power as well, making transport times faster. Ergonomic controls provide greater visibility when loading and positioning. Capacities from 1,500 lbs. to 3,000 lbs. make these stackers useful in dock and rack areas as well as order picking, stocking and restocking. Lift heights range from 62″ to 150″. Non-straddling stackers can work with standard GMA pallets and skids and have a capacity of up to 2,000 lbs. With a lift height of 34″, these stackers are great for transporting and lifting closed bottom pallets without having to straddle them. Outriggers provide stabilization without straddling the load while lifting the load and can be moved under the lifted load during transport. If your facility has narrow aisles and way too much pedestrian traffic for forklifts to be in the mix, you do have other options for getting materials from one place to another without using motorized vehicles. Whether powered lift hand trucks, lift transporters or some kind of stacker, there is a solution for the material handling transport issues you face.